During the 1970s there was a series of rises in the oil price as oil-producing countries decided to limit output. This led in the short term to an increase in petrol prices, but it also flowed through into higher freight costs, higher costs for goods, higher wage rates, and so, eventually, into general price inflation. 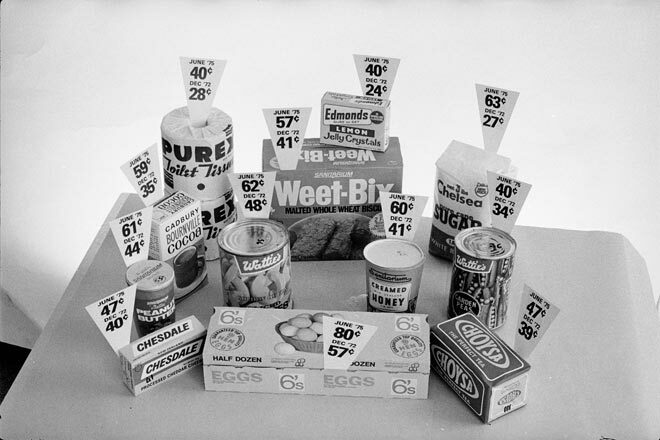 This display shows how much the prices of household items rose between 1972 and 1975. Much of this increase was a reflection of a general increase in prices – inflation – but where the rises were especially great, such as in the price of sugar, this is a relative increase in prices for that good.